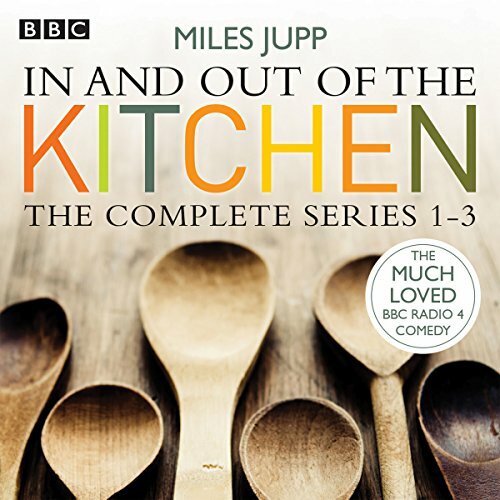 Miles Jupp stars as fussy food writer Damien Trench in three series of the much-loved BBC Radio 4 sitcom. Well-known cookery writer Damien Trench is famous for his book A Year in the Kitchen, a diary of everything he cooked and ate over the course of 12 months. Now, for the follow-up volume, In and Out of the Kitchen, Damien undertakes to open up the doors "not only to my kitchen, but also to my life". But is Damien’s life as idyllic as his listeners might suppose? During the course of these 16 episodes, we follow the ups and downs of life for Damien and his partner, Anthony, as Damien films a pilot for his TV series Poets and their Palates, appears at a literary festival, dips his toe into the world of journalism, contends with the well-meaning interference of friends, family and builder Mr Mullaney, and faces many other trials and tribulations. Many of Damien’s recipes are included along the way. As he himself might say, enjoy - and more importantly, cook. I enjoy anything with Miles Jupp in, I appreciate his intelligent humour. In my opinion one of the best comic actors we have. This audio book exceeded my expectations, I had already listened to a few episodes on radio 4, so I eagerly awaited any chance to revel in this delightful comedy. The relationship between Damien and Anthony is the main thread of the story but I particularly loved Damien's mother. I cannot recommend this highly enough. My husband and my sons have enjoyed it too. Don't hesitate, download it now and you will be smiling all day long! Loved this - such warm , gentle and clever humour. Miles Jupp is so funny! The casting is excellent. What did you like most about In and Out of the Kitchen, Series 1, 2, and 3? I use audio books somewhat like a non-chemical sleeping tablet, turn it on & drift off to sleep. However, IN AND OUT OF THE KITCHEN failed miserably as a sleep aid; I choked with laughter! This fun-induced insomnia creates daily flashbacks of hilarious incidents. What other book might you compare In and Out of the Kitchen, Series 1, 2, and 3 to, and why? Nothing comparable comes to mind! What does Miles Jupp and Justin Edwards bring to the story that you wouldn’t experience if you had only read the book? What is so funny about relating builder's parlance, for instance "de four-b-twos"? Comprehending the richness of Mr Milenney's participation in the story could only be appreciated in audio. This whirlwind of chaotic hilarity is a love story. The writer takes mundane domestic occurrences as his raw material and recycles the incidents so that we not only laugh at the story, but at ourselves. Hidden in the folds of fun are the serious real life stuff of relationships in society, tenderness and love. Would you listen to In and Out of the Kitchen, Series 1, 2, and 3 again? Why? I would listen to this series again and in fact have recently started the first series again. The best part of the audiobook is Miles Jupp's narration. The stories build gradually and give time for you to get to know them well. Miles Jupp's narration and comments during each episode is played very low key but his timing is brilliant and asides can be very caustic. In and Out of the Kitchen - see how truly humble I am. There aren't many characters but that means you get to know them very well especially if dipping in and out to each episode rather than listening to the whole set as an audiobook. What a find Damien Trench is...! Brilliant, funny and intelligent Miles Jupp is a great sit-com writer, great cast, particularly Justin Edwards ... and no canned laughter! The story isn't a laugh out loud kind of humor, instead it slowly builds and puts a lasting smile on your face. The characters are endearing people, full of flaws which you end up enjoying rather than being annoyed by. The performance is great and the continued recipes throughout are used very successfully at breaking the story up nicely. It almost feels as if they are used as emotional grammar in places, which is sometimes how I cook. I think In and Out of the Kitchen works better in audio then it did on TV, but saying that I did enjoy it on TV. Can we have more please . Enjoyed listening to this on Radio 4 and now enjoying listening as and when on Audible. Very funny and have been tempted to try out the recipes. If you could sum up In and Out of the Kitchen, Series 1, 2, and 3 in three words, what would they be? Nothing but then I haven't listened to a cookery book before. Very restful voices and easy to listen to. It felt as if I were a friend, invited for dinner and being told a witty story. I wouldn't say I was moved by anything, more like a developing friendship and general interest in the happy progression of people's lives, their family, friends publisher not forgetting the builder. This is the first time I have made bookmarks for recipes in a story. I find I keep popping back to the book to find a recipe, then re-listen to the whole chapter as I companionably cook along to little observations and pearls of wisdom to cheer up a rainy day. Thank you for sharing your lives and recepies.